Here you see some in-route screenshots and some new foliage. I am half way the route. Still a lot of work, but I almost stopped making scenery now, so it should get on..
Used my spare time to finish my apple tree. Here are the in-game results. These shots are from my route. Back to real world..back to work, have a nice week. I used this tree to make a mid-distance group of apple trees to safe the fps. Therefore I made a single box with tex shader, and used it as a child for my apple tree. This evening I've tried to make a apple Tree for near view. It's is made using 3 shaders. The texdiff shader for the 3D trunk, and both flora shaders for the leaves and twigs. I've added a video of my route with some new animated objects. All objects except the church bell I used the 'scrolling uv' option in Max. Also the helicopter uses this option, so i could make a traffic bleuprint, so it can flying through the sky with rotation rotars. Today I present a few pictures of my Foliage pack. It is included in my route and will contain around 70 assets, most weeds and small plants. Now I have 62 assets, but some of them haven't got the quality I want. Now I have reached the country side of my route, I am making some assets for farming. The facing foliage shader is a very simple but good solution for making beautifull foliage. Look at the Derek Siddle blog for more nice examples. 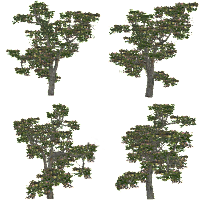 On the images here you also see some examples of the custom procedural foliage and tree lofts in my route. Some routebuilders used my de-local tracks. For this route I made 2 new track types. A set of tracks with wooded sleepers and a set of concrete sleepers. Both sets will have own switches with animated manual and automatic levers. The sets supports the 'blend' option of the editor. Especially nice the make the end of the track rusty. Both sets will have a own ground gravel-texture supplied in the environment section of my route. Also tunneltracks are included. Sounds are unfortunately the Kuju ones, I don't have the skills yet to make my own custom tracksound yet. Here you can follow the development of my route for Railworks. It's a fictional route situated in Germany, with a strong local atmosphere. Today I start with some pictures of the finished parts of my route. Next posts will give some more information about the number of new objects, and other technical details.